Finally SeaMonkey Portable is Released. I was Waiting for Long Time for It. Three Cheers to All SeaMonkey Fans. Any reason this was never added? Its up to 2.0.4 now. Although the browser itself is probably the slowest on the site, it also has a stable and well-maintained, email, irc client, and html editor. I'm not sure if that means its worth posting, just that someone might find a use for it. This is among a list of programs I'm putting off adding just because I've been occupied with other things. I kept thinking this program would croak at some point and the maintainers would drop it but instead its actually encroaching on the untouched KompoZer program SeaMonkey originally spawned. The program leaving behind your email address (its not literally username@domain.com -- I swapped that for my real email address) on a computer you use, that's not ideal. Definitely not stealth. However, RegFromApp didn't pick this up so its possible this is a Windows feature and not something that SeaMonkey did. I still don't know enough about the Windows registry to say one way or the other. Can someone speak to this? Although the browser seems to have caught up in a big way to Firefox, the mail client appears to have fallen well behind the Thunderbird offering. It's your account name (not your email address unless you name your account the same as your email address instead of "Personal", "Work", etc) and it's a useless Windows feature to show your unread mail count from the login screen. And it is handled by the launcher (I just verified it myself with a test), cleaning it up on exit and restoring any UnreadMail bits left behind. Are you sure it is left behind on exit? Did you launch using the launcher (not seamonkey.exe)? Did you set it as the default handler for something and have it launched that way? > Are you sure it is left behind on exit? Did you launch using the launcher (not seamonkey.exe)? > Did you set it as the default handler for something and have it launched that way? Nope. This is a clean Windows install under VMware so I can revert to the original Windows state after every test. No special settings or changes were made. This may have gotten cleared up. I haven't tested yet, but here's the post addressing it. Thanks for finally adding that, donald. I was always a fan of Communicator and continue to be a big fan of the included HTML editor, but didn't see any interest. I do hope future versions of the software pull in Sunbird's calendar client (or via Lightning). 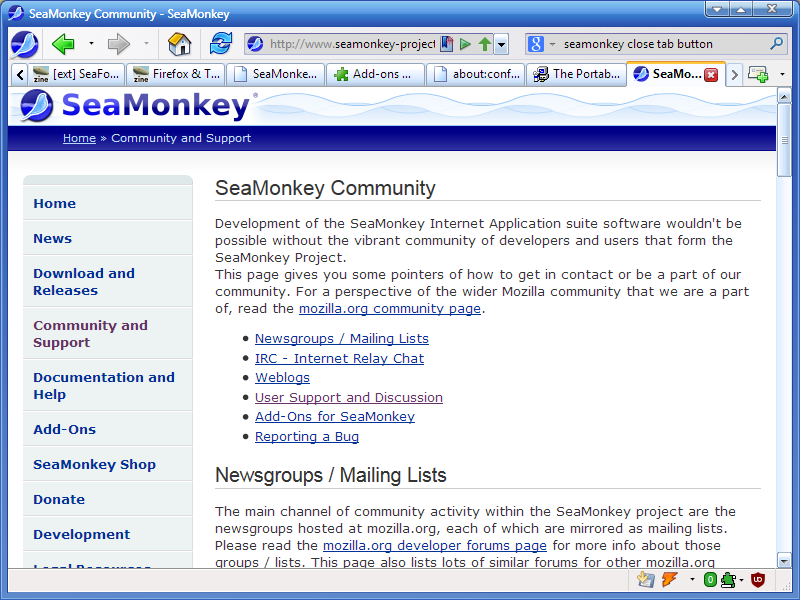 It should be said that the latest Seamonkey release (v2.40) is based on the Mozilla v43.x engine. Moreover, I have no need for a full program suite -- with mail and chat clients and HTML editor -- so I immediately started tweaking the PortableApps version to make it more amenable to my taste (you can judge the results by the screenshot below). I intend to detail here the gist of my customizations, so I can return to it should there be need, and it might be of use to someone else. Let me start with extensions. 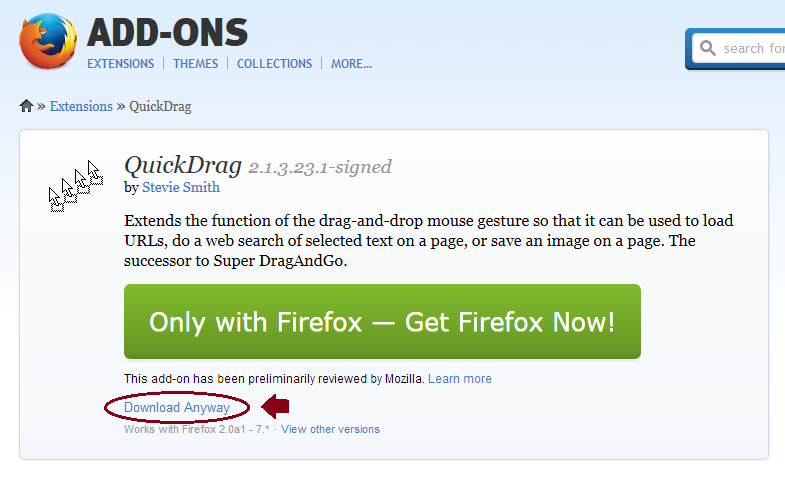 On first look, most of Firefox extensions aren't even compatible with Seamonkey. To make the case worse, a lot of the extensions present in the official Seamonkey addons page appear not to work with the latest version. Fret not, succor is on the way. Back in 2013, user robertcollier4 commented with a method to overcome this limitation (see http://www.portablefreeware.com/?id=2089#comment24727) that, while doesn't guarantee 100% success, still works fine for many extensions. Better yet, anyone wanting to make sure that an essential extension would work with Seamonkey is advised to check the Extension Compatibility Tables for SeaMonkey homepage, at http://addonconverter.fotokraina.com/compatibility/ -- which also offers automatic conversion and installation services for compatible entries, should you be willing to trust the page (you shouldn't, by all means). author of https://addons.mozilla.org/en-US/thunderbird/addon/tiny-menu/ wrote: Replace the standard menu bar with a tiny menu popup. Sea Fox brings back the familiar interface to prior Firefox users, while doing away with some weird behaviors. Tiny Menu (attached to the top left big Seamonkey button, an icon readily provided by the PAF package in the 'App\AppInfo' sub-folder) gave me the vertical menu I was already using in Firefox -- one caveat is Tiny Menu can't be placed next to the toolbar buttons, but all toolbar elements can instead be moved next to it. There were many other tweaks, but I'll be stopping for now... To Be Continued. Last edited by Midas on Thu Jan 18, 2018 9:07 am, edited 1 time in total. How is that possible? To many addons? Hundreds of tabs? x64 version? Electrolysis? Not in every situation, but slowdowns are nearly always a really badly behaved extension. This is one reason that Firefox is switching to the lighter weight extensions model later this year. Power users would often load up on a ton of mostly-unnecessary poorly-maintained extensions and then get frustrated that Firefox was slow and used too much memory. They'd switch to a clean version of Chrome and think "Ooo, this is so much faster" and add in just a handful of extensions that are the lighter weight kind Firefox is switching to. Not claiming this is going on here, of course, because every situation is different. The memory itself, though, can be mostly ignored. Firefox will dynamically allocate memory based on how much your system has and how much is free to use as a RAM cache for pages in addition to the disk cache. I cut down my Firefox to just uBlock with a specific set of filters and reset all the settings. It's nice and fast and light. ADDED NOTE: It's also worth noting that Firefox x64 uses quite a bit more RAM than x86. Firefox Portable automatically switches between them based on the OS. Last edited by JohnTHaller on Thu Mar 17, 2016 4:05 pm, edited 1 time in total. Tabs should be managed in GTD fashion to be any useful. Last edited by shnbwmn on Thu Mar 17, 2016 2:29 pm, edited 1 time in total.